The Bucks have their sights on their first Finals appearance since 1974, while the Lakers have theirs on vacation. The Bucks have their sights on their first Finals appearance since 1974, while the Lakers have theirs on vacation: 1-2-3, Cancun! ([as the TNT guys would say](https://www.youtube.com/watch?v=MG1bgxv0IiU)). Los Angeles is on a 2-10 run straight up and 1-11 against the spread as it finishes a five-game road trip as a 13-point underdog in Milwaukee as of Tuesday morning at the Westgate SuperBook. The total for the game, which can be seen at 7 p.m. CT on NBATV, is 236, while the Bucks are -1200 on the moneyline and Lakers +750. Milwaukee forward Giannis Antetokounmpo is [questionable with a right ankle sprain](http://www.espn.com/nba/story/_/id/26298922/giannis-questionable-vs-lakers-ankle-sprain) suffered in [Sunday's 130-125 home loss](https://www.thescore.com/nba/events/135644) to the Sixers, though he is expected to give it a go. The 24-year-old had [a career-high 52 points](https://www.youtube.com/watch?v=6oBi5353niE) with 16 rebounds and seven assists against Philly. Los Angeles (31-39, 13-23 road) has the worst ATS record in the league at 27-42-1, including 15-21 on the road. 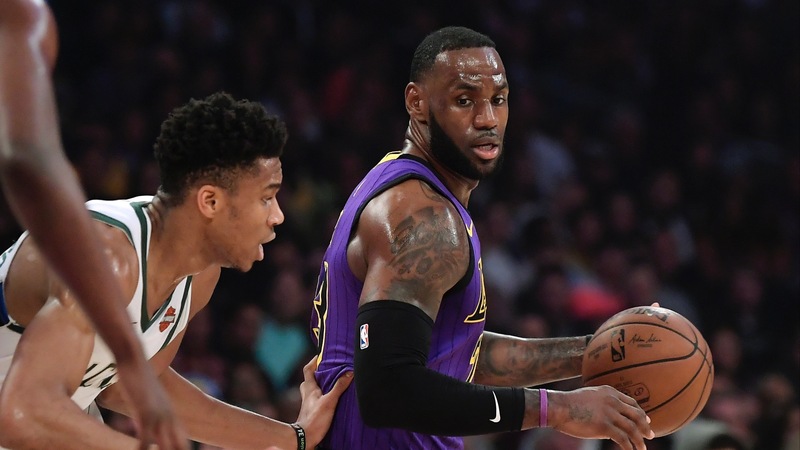 Will the Lakers show some pride in Milwaukee, or will LeBron James and company give the hot-take machine more fodder as the impending offseason grows ever closer? <a href="https://www.youtube.com/watch?v=EK91FUfws44" class="embedly-card" data-card-width="100%" data-card-controls="0">Embedded content: https://www.youtube.com/watch?v=EK91FUfws44</a> Lost in all the hubbub about where James sat on the bench was the fact that his potential game-winner in Sunday's loss to the Knicks [was blocked by Mario Hezonja](https://www.youtube.com/watch?v=57-hZHMQnXU), who had six blocks all season before denying The King. Oh, and [James' minutes restriction](https://www.betchicago.com/lebron-james-minutes-restriction-sportsbooks-reaction) seems to be a loose one, as he's played at least 32 minutes each of the last three games. And while he's still getting his numbers -- 33 points, six rebounds and eight assists Sunday in New York -- he went 0-for-6 from 3-point range and he's shooting only 64 percent from the free-throw line this month. Los Angeles is 1-3 SU and 2-2 ATS this season as a double-digit underdog, but James wasn't in the lineup for any of those games. As for the Bucks (52-18, 41-26-3 ATS, 27-6 home, 19-13-1 ATS home), who have [the league's best record](https://www.thescore.com/nba/standings), Sunday was their first home loss since Feb. 9 against the Magic. Milwaukee is 19-2 SU and 13-7-1 ATS this season as a double-digit favorite. With that, let's get to the rest of the six-game Tuesday NBA card, including Golden State coming off a Monday loss in San Antonio. __MORE:__ [Favored Warriors have plenty of issues to overcome before a three-peat](https://www.betchicago.com/warriors-issues-favorites-three-peat) ## Tuesday NBA betting lines, odds, trends *Odds from Westgate SuperBook; all times Central; records from [TeamRankings.com](https://www.teamrankings.com/nba/trends/ats_trends/?sc=all_games)* ### 76ers at Hornets odds, 6 p.m. PHI: 45-25, 33-37 ATS, 17-16 road, 14-19 ATS road CHA: 31-38, 30-37-2 ATS, 21-14 home, 16-17-2 ATS home __Spread:__ Pick 'em __Total:__ 225 __Moneyline:__ 76ers -110, Hornets -110 __Betting tips:__ Philadelphia will be without center Joel Embiid, who'll get a rest day. He had 40 points, 15 rebounds and six assists in Sunday's win over the Bucks. ### Rockets at Hawks odds, 6:30 p.m. HOU: 44-26, 32-36-2 ATS, 18-16 road, 13-20-1 ATS road ATL: 24-47, 35-36 ATS, 13-21 home, 14-20 ATS home __Spread:__ Rockets -7.5 __Total:__ 232.5 __Moneyline:__ Rockets -330, Hawks +270 __Betting tip:__ Houston has won 11 of 12 SU (6-5-1 ATS). __ALSO SEE:__ [Odds to win Eastern Conference bunched up heading into home stretch](https://www.betchicago.com/nba-title-odds-futures-bucks-raptors-celtics-76ers-4-1-or-less-to-win-east) ### Warriors at Timberwolves odds, 7 p.m. GS: 47-22, 28-40-1 ATS, 23-12 road, 16-19 ATS road MIN: 32-38, 34-36 ATS, 23-10 home, 19-14 ATS home __Spread:__ Warriors -6.5 __Total:__ 229 __Moneyline:__ Warriors -275, Timberwolves +225 __Betting tip:__ Golden State is a league-worst 2-6-1 ATS on the second night of back-to-backs. Center DeMarcus Cousins is questionable with an ankle injury. __Bookmark us:__ [Daily NBA betting coverage](https://www.betchicago.com/nba-betting) ### Nets at Kings odds, 9 p.m. BRK: 36-36, 38-34 ATS, 15-20 road, 20-15 ATS road SAC: 34-35, 41-26-2 ATS (best in league), 21-14 home, 23-10-2 ATS home (best) __Spread:__ Kings -4 __Total:__ 232 __Moneyline:__ Kings -175, Nets +155 __Betting tip:__ Sacramento has won four of five ATS despite being 2-3 SU in that stretch. Brooklyn has lost three straight (1-2 ATS) on its season-long seven-game road trip. ### Pacers at Clippers odds, 9:30 p.m. IND: 44-26, 35-34-1 ATS, 17-17 road, 14-19-1 ATS road LAC: 41-30, 40-31 ATS, 22-13 home, 19-16 ATS home __Spread:__ Clippers -5 __Total:__ 219 __Moneyline:__ Clippers -205, Pacers +175 __Betting tip:__ Indiana, which lost Monday night in Portland, is 9-4 on the second night of back-to-backs. __PLAY:__ Our free [Daily NBA Pick 5 game](https://betchicago.chalkline.com/games/nba-pick-5). Pick five select NBA games ATS to win a BetChicago prize pack.